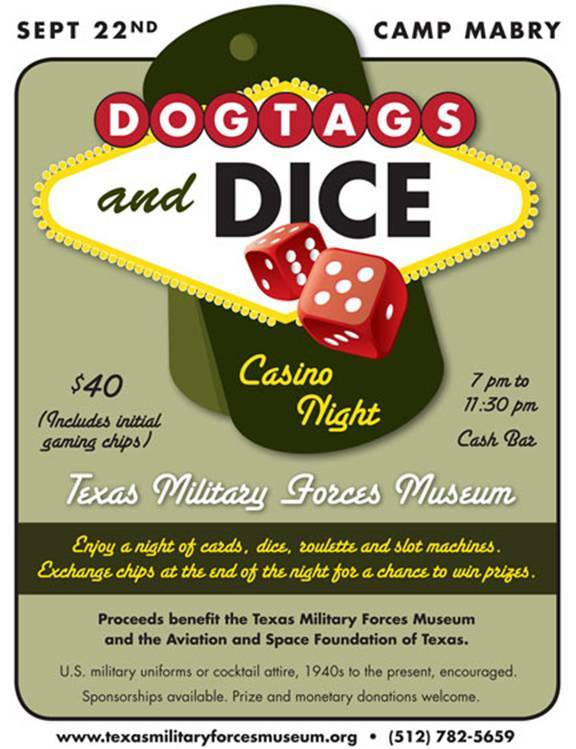 You are cordially invited to join the staff and volunteers of the Texas Military Forces Museum and the Texas Military Forces Historical Foundation for our upcoming “Dog Tags and Dice” Casino Night fundraiser at the Texas Military Forces Museum. Payments buttons will be available on the website (www.texasmilitaryforcesmuseu.org)later today or you can call or stop by the museum to purchase. Cash, Check, Debit or Credit Cards and PayPal accepted. Chip cash-in/Prize drawings: 11:00 p.m. – 11:30 p.m. Event ends/Doors close: 11:30 p.m.
Attire: Military uniforms and casino attire from the 40s through the present encouraged, but not required. No Axis uniforms or those of other opposition forces. No weapons. Mission: R and R. Enjoy a night of cards, dice, roulette and slot machines. Exchange chips at the end of the night for a chance to win prizes. The more chips, the better your chances. Kick back in the casino lounge. Tour the museum and walk back through history. Chow: Light snacks, coffee, tea, and a cash bar. Sponsorships Available. Prize donations accepted. Monetary donationswelcome. Sponsors and contributors will be recognized at the event. Please feel free to pass this along to all who might be interested and to contact us if you have any questions.